When I wrote my Lebanese cookbook more than 20 years ago, sumac was still a relatively unknown ingredient, unlike now when almost everyone knows what it is, and more to the point can find it fairly easily. Anyhow, my mother told me all about how it is picked and dried, and then ground and I put all the information in the book together with how if you picked it from the wrong plant, you could die. 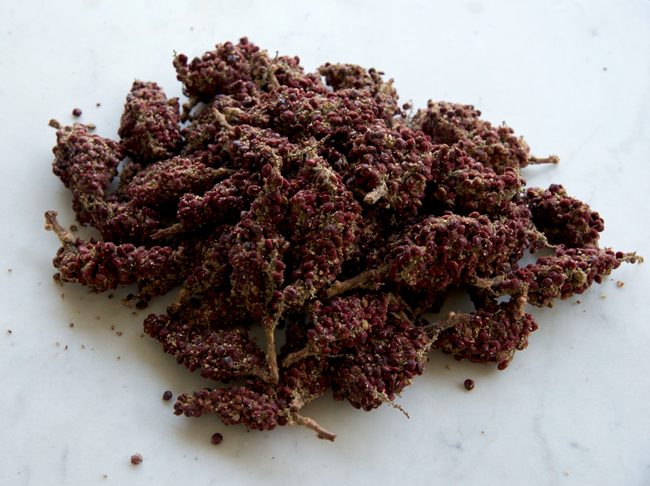 Thank goodness for my mother being the fount of knowledge on all things culinary in Lebanon because I had never seen sumac either on the plant, or being dried and until recently, I only knew it in its ground form. But one day, a few years back, I was walking through souk el-Attarine in Aleppo and I found stalls selling sumac on the branch (‘ala al-‘anqoud as it is described in Arabic) and whole berries after they have been rubbed off the branch; and one guy was selling it ground with the seed and ground without — I honestly could not tell the difference. And two years ago, I found it being sold on the branch driving through the south of Lebanon . However, it is only two days ago, that I finally saw the whole process. A few years ago, my mother was quite ill and I spent a fair amount of time in Beirut, first making sure she got the right treatment then helping her recover. Quite naturally, this disturbed my London routine including who washed and ironed my thousand and one white shirts – those of you who know me, know that I only wear them. This may be a shallow consideration given the gravity of the situation but I needed to look impeccable regardless. This is where Sabah, a rare person, came into my life. She had just opened a dry cleaning place down from my mother’s home, and I took my first lot of shirts to her. Women in Lebanon are very fashion conscious (well, in a very Lebanese sort of way!) and few would consider wearing the same clothes two days in a row let alone have a uniform. My white shirts intrigued Sabah. She couldn’t understand why I had so many! I also intrigued her. She knew my mother but had never met me. But she was very well disposed towards me because of my mother, and became even more so when I told her I wrote about food. I went to Waitrose today with the intention of buying one chicken breast for a recipe I was testing. As I looked at my options in the organic section — I only buy organic chicken; I used to trust free-range but I don’t anymore; am not even sure you can trust organic but if I start on this path, I will probably end up eating nothing which may not be such a bad thing at least for a while — I realised that I could buy a whole organic chicken for only a little more than the price of the pack of breast filets I was looking at. They were more than I needed anyway, and I wouldn’t eat what I don’t use — breast is my least favourite part of the chicken. So, I bought the whole chicken and jointed it myself, deciding to marinate and roast the legs and wings to have for my lunch, use one breast for my recipe and freeze the other in case I needed to test the recipe again. Now, if I were roasting the chicken whole, I would have kept it plain finishing it with either lemon juice or sherry to have a tasty gravy. 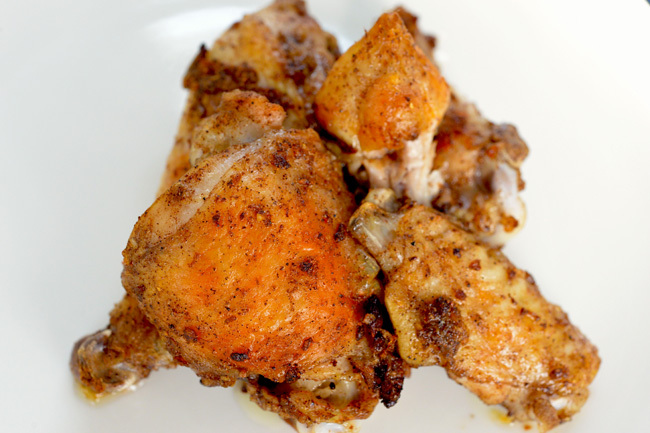 But for the pieces, I decided to make the marinade I use for wings, with garlic, spices, lemon juice and olive oil. Here is the recipe. As you can see from the picture below, I really enjoyed my lunch! It was lucky I rented my little Sicilian casetta during orange blossom season. I had included a recipe for the jam in the book I am working on right now and was wondering how I was going to test it. Well, I didn’t have to wonder too long as I walked with Mary through her citrus grove and found the trees bursting with blossom. 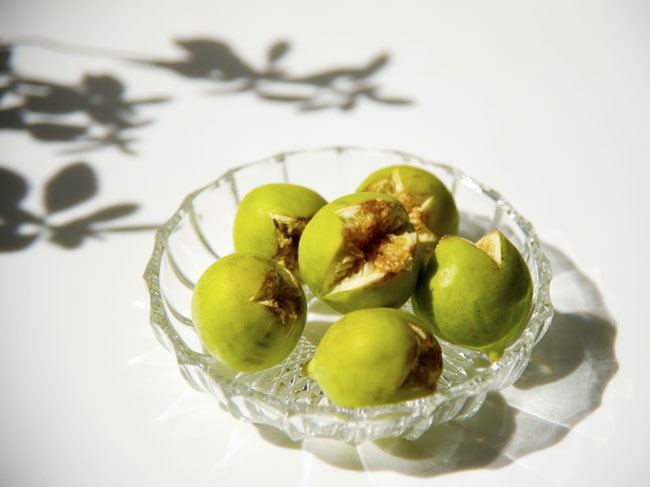 All I had to do was decide which of the blossom were the right ones for the jam — some were small and others large and fleshy. 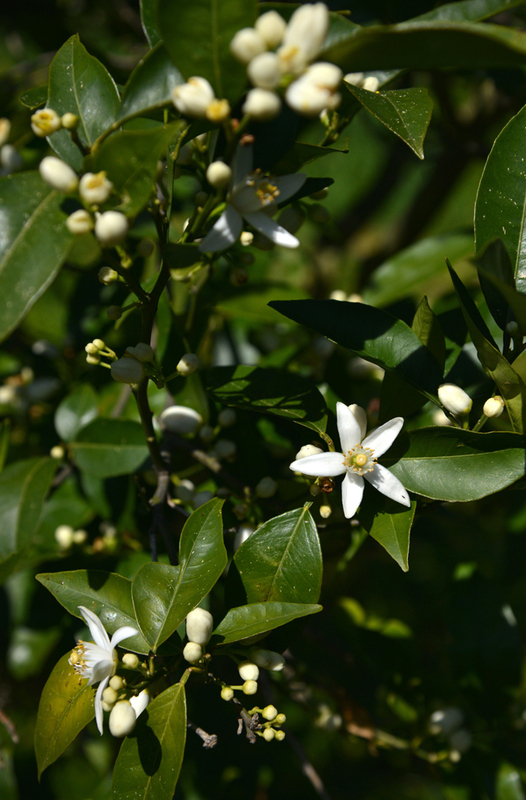 Thinking back to the orange blossom jam of the Lebanese sweet-makers, I decided to go for the fleshier kind and the next day, Amy and I went down early in the morning to pick 1 kilogram of blossom, which was the quantity I needed for the recipe. We quickly realised that if we were to pick so much, we would be spending the rest of our week making the jam. Not only would it have taken forever to pick the blossom — the flowers are surprisingly light — but we would have had to spend hours picking the petals off them. So, I decided to cut down the recipe to a quarter of the quantities and after a good half hour at least, we had picked what we needed.